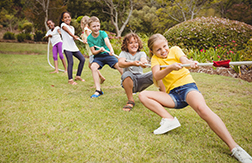 There's a YouTube video of 12-year-old Aybatyr Myrzabae competing with teammates in a tug-of-war competition that has racked up an incredible number of worldwide views. Who wouldn't want this kid on their team? How can we as parents and coaches nurture our children to develop these intangibles?